Obtain free NSF PST converter software at eSoftTools, available application has potential to convert NSF to PST free without missing any NSF data. Software is exclusively designed with peerless techniques which are virtually beneficial for users and that’s why users should go with this if they are looking for NSF converter freeware tool. All at once download NSF PST converter freeware software and use this master application for Lotus Notes mailbox in Outlook PST conversion with the pursuance of few given steps. Manifested free NSF PST converter tool works for Lotus Notes mailbox recovery and existing database conversion to PST file. Very quick & smart technology driven software for NSF to PST migration. Process to convert encrypted Notes NSF database to Outlook PST file. Makes 100% reliable conversion and accuracy of NSF to PST Conversion. Easy to handle all version's of lotus notes conversion. Faster scanning engine to load unlimited size of NSF file and the same convert into multiple formats. More than one conversion option like NSF to PST, EML, MSG, MBOX, EMLX, HTML, CSV, ICS, vCard file. No any MS Outlook dependency for eSoftTools NSF to PST Converter. Generate and preview of every Notes items before going to actual nsf conversion. Unlimited Notes NSF database conversion facility. The resultant/ output PST file always be in Unicode format. Demo Facility: The demo version of software provide flexibility to save 25 items from each NSF folder into every format. NSF converter freeware software gives various choices while converting data from Lotus Notes. Here, with this tool users can select the desired format in which they want to save their NSF data. 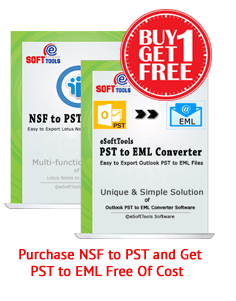 Software gives option to convert NSF to PST, EML and MSG format. Software gives choice to either export NSF file data completely into PST file including contacts, emails etc. or users can import contacts separately from Lotus Notes to CSV format. Use given conversion option to save, contacts in CSV. Without wasting user’s previous or valuable time, eSoftTools NSF to PST file converter tool quickly export Lotus Notes database to PST file. The given application has accelerated recovery and conversion process. Import each and every existing Lotus Notes mailbox folder (email, Journals, contacts, calendars and tasks etc.) in MS Outlook as .PST. It keeps data as it is with exact formatting and save folders, subfolders orderly with identic format. While converting Lotus Notes database into PST file or in EML file format or in MSG format, users can preview their NSF data in TXT & HTML format, both. This is the unique features added on this software just for user convenience. 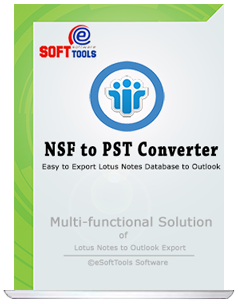 Lotus Notes converter software available at eSoftTools is absolutely effective and safe for NSF database conversion into PST file. It migrate Lotus Notes to PST file safely without any data loss and without affecting data formatting. Best Notes Database to Outlook migration software successfully support all version's of IBM Lotus Notes NSF file for recovery and conversion. User's can easy to migrate NSF to PST from Lotus Notes 9.x, 8.x, 7.x, and below ones. This software has no any dependencies of MS Outlook anymore.. That means user's can convert notes nsf to pst file without having/ installed MS Outlook on their computer. The converted/ resultant PST from NSF file is always be in unicode format that supports to open by any version of MS Outlook. Use available Notes export free demo which gives preview of software functionality, features and efficiency before purchasing tool. Users will get satisfaction with this demo without investing single penny over it. eSoftTools gives privilege to use free demo just for user-satisfaction and giving free conversion NSF to PST so that users purchase this application confidently without any doubt. Demo Flexibility: Save 25 item's from every folders only. Purchase eSoftTools NSF file converter full version which is efficient to save Lotus Notes mailbox data in multiple format and works with various impressive features. Cost of this application is comparatively low and anyone can afford this Lotus Notes converter tool for successful conversion of NSF into PST. With full version, user can convert nsf to pst, mbox, eml, msg, emlx, html, csv, vCard, html and ics file. Full License Facility: Licensed version software export everything from NSF. "Hey, I am here to give big thank to your team for giving such a brilliant tool which helped me to restore Lotus Notes data in MS Outlook as PST format." I like it very much specially NSF to MBOX Conversion because my manager gives me task to import NSF emails to Thunderbird and your software for NSF converter will do it easily. A big thanks for creating awesome tool. Get touch with us with Social Media Sites. We give our updates and news related eSoftTools on it. 2019 NSF PST Converter Software. All Rights Reserved.